Hello my little turtles, I am Sensei François and since this is my first post here a little introduction is in order. First of all, I am more a painter than a gamer, although I like to play at least once in 2 weeks. I have been painting minis since 1996, when I started using minis for AD&D. Thankfully, there are no pictures of these minis around to be shown. I've done a few commission works, but I mostly paint my own stuff, as I tend to play a lot of different games (Dust Warfare, Dark Age, Super Dungeon Explore, Anima Tactics, Malifaux, Warmachine; and add to that Relic Knights, Kingdom Death and Arena Rex when they ship). But Enough gum-flapping about myself, on with the show! 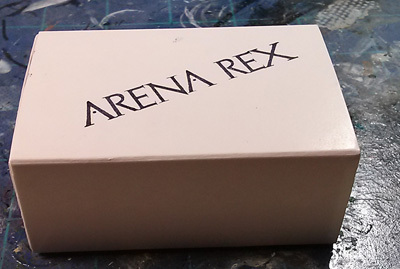 So here's the little box, with the game's name on it, simple and elegant. 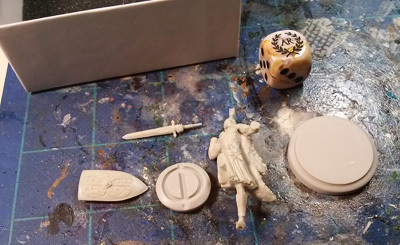 Here are the pieces, unboxed and with the "sprue" removed. Weirdly I forgot to put the right leg in the picture but it's not too dramatic. So here's my impressions of the raw product: this is a piece of art, the anatomic precision is impressive! The sculptor, Sebastian Archer, did an amazing job on this piece and I am eager to see the others he will make for this game. There was only one little bubble under the left foot, but since I was to put a pin right there anyway, it's not a problem. The round piece with the Phi symbol is a token for the gameplay which will cover the exhaustion status of the warrior (if I read it right), and I will not show any further. The die is etched, which increase its lifespan. 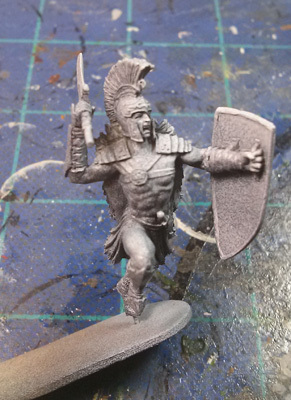 So here he is, assembled and primed (using a black primer then a thin white at an angle). 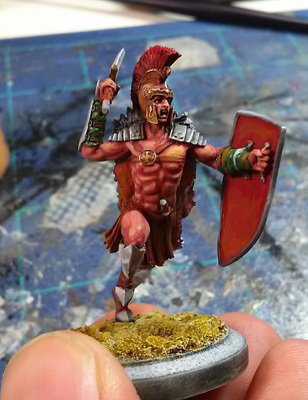 At this point, the flesh is mostly done, starting from a dark brown flesh and working to lighter tones, and no wash here. 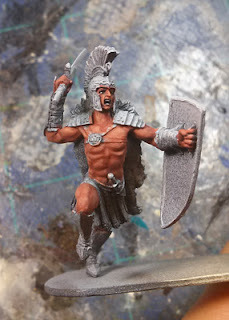 This gives him a darker and more red hue to the flesh, as I expect his work will give him a tan! 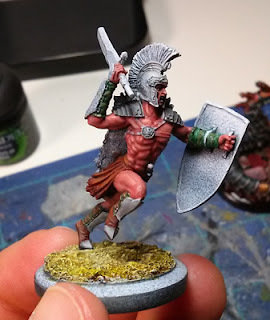 For the base, I kept it simple, since he's in a gladiator's pit. So I mixed sand with Acrylic gel (my secret weapon for many things!) Once dry, I again used both black and white primers. So here he is on his base, pinned solidly. The sand was colored with a mix of inks and washes, with a quick dry brush to finish the whole. This was done before pinning him there, of course. You will have noticed that most of the legs are finalized, or at least almost done, as adding the base will give me a firmer grip on the model as I work, but it also reduces my working angles. So here he is almost done. I had this weird idea of doing NMM, I usually don't use this technique so I guess it'snot perfect, but it'll do, I'm not going for a Crystal Brush here. For the cloak I went for a wolf pelt (I found this one too small to be a lion and the wolf is an important animal for Rome). First step was too look for a reference on Google with an interesting pattern. I am pretty happy with the result here, as it was quick and efficient. With such a texture, I had no choice but to use a bit of dry-brushing, which I usually keep only for sand. And here we have the final result. I did some fancy "marble-like" base as this game will have no front/back arcs. All in all, this was not too long too paint (a few hours over the course of a week) and was very pleasing. I heartily recommend getting on the kickstarter, as the game seems to be fast-paced and dynamic. 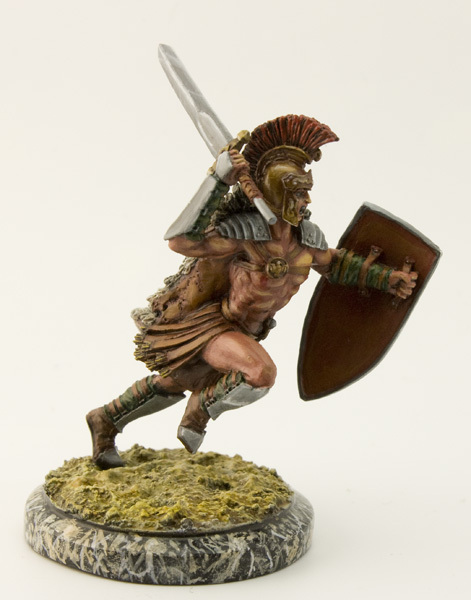 Of course it might seem pricey, but this is a resin piece of art, and if the whole range is as good, it might well go in my top games, along with Kingdom Death (I guess look is my main concern for miniatures games), as they are both in the same quality range. So once again, the Kickstarter is on until April 21 and it worth a good look! For now, that's all for me, but stay tuned for more reviews like this. This was not a tutorial but if you have technical questions, you are welcomed to ask them in the comment section and I shall oblige! Very well done, the model looks fantastic! Hopefully this will being a few backers to the KS. 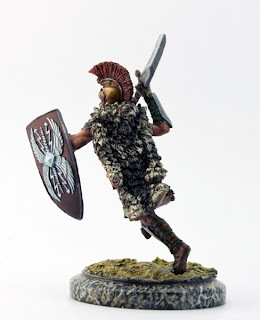 One question (if it's not asking too much): How did you paint that marble effect (it looks brilliant and fits in perfectly with the theme of the game!)? First step: find a marble reference you like. For mine, I started on a black background, then dabbed some dry white paint, then white lines. After it dried it washed the whole with a Sepia ink to give it the wanted color. Then, once dry, I did a few more white lines. The final touch is a few layers of Satin varnish. The good thing with marble is that there are so many possibilities that you can find one suited to any level of painting. And I do hope it helps a few people decide to get in the KS. Cheers dude, very much appreciated. 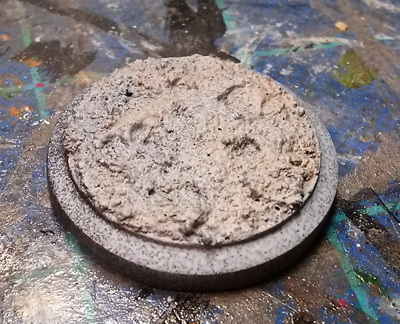 I think I will copy your technique for my AR bases, as it goes so well with the AR theme. Maybe different colour marble for the different Ludi, in line with the faction dice. Thanks again! Wow! Could only peek but not read because of all the work I had today but finally I get the chance to read and....Wow! 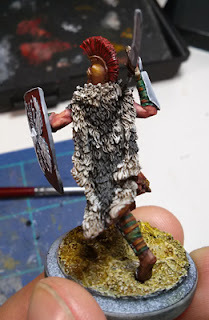 Really cool paintjob (the pelt is great). Looks very simply painted, but the excecution of the skin tones and pelt are perfect. 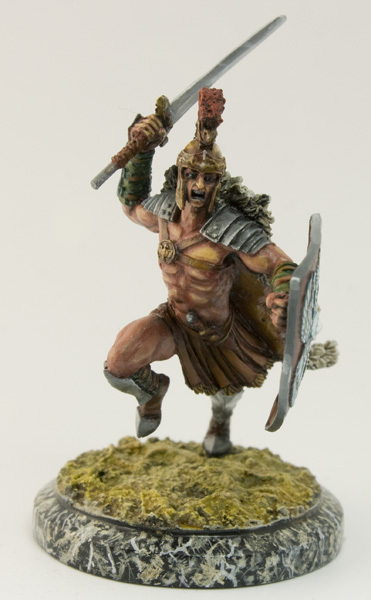 I won one of these models in a draw, and have yet to recieve it. I hope I can get it up to something near this standard!